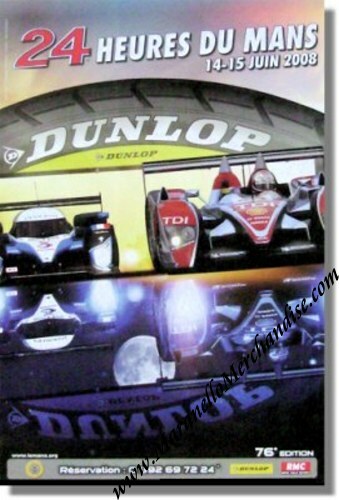 2008 24 Heures du Mans Race Poster. June 14 & 15, 2008. A great poster from the so-called "Computer graphics and Sponsorship" era in Le Mans posters. Design by Agence Comquest after photographs by Nicolas Cousseau. The poster shows a dramatic rendering of the night and day duality as a permanent symbol of Les 24 Heures du Mans. The mirror effect of the graphics is particulary impressive. The cars are the stars and the legend continues. The race was won by Rinaldo Capello, Allan McNish & Tom Kristensen in their # 2 Audi R10 TDI with a total of 381 laps to their name. For the full results of this race, please see 24 Heures du Mans results 2008.